Nick gathered up the paperwork, and prepared to set off to do our clearance. Finally, after weeks and months of talking about leaving, we ready to go – more or less. Leaving with us aboard Mollymawk would be two Chilean friends: Manu, a hippy from Concepcion, and Yona, a fisherman and lost soul from the fiords. It just so happened that it was Manu’s birthday, and she suddenly realised that this meant that her ID card was due for renewal. Manu didn’t actually burst into tears right there and then. She saved herself for the authorities in the Registro Civil. Sorrowfully, she explained that the boat couldn’t wait while they took a week to renew her ID card. Mollymawk‘s temporary importation permit was due to expire on the 31st. And the tender-hearted authorities duly provided her with a temporary ID card to wave at the armada. Bueno! Off went Nick to the armada, to get the zarpe. And what should occur here but the discovery that Yona’s passport had also expired, several months since! 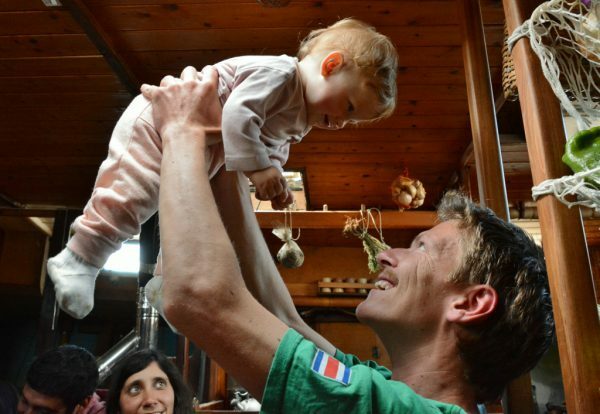 Perhaps Yona’s ID card would still be valid – and an ID card is all that a Chilean needs in South America – but, alas, at this moment Yona was driving to Puerto Montt, taking his little boy to spend the weekend with his grandmother. Yona was promptly inundated with phone calls, texts, and other messages, telling him to stop the car and turn around – or at the very least, to provide, forthwith, a scan of his ID document. But Yona was driving, and so, being a law abiding citizen, he didn’t get any of the calls until he was two hours down the road, at his destination. Then, happily, he was able to provide a scan of his card; and it was in date; and the authorities accepted it. Can you imagine what sort of reception one would get in a British ‘customs and excise’ department, proffering a smart phone with a scan of the potential crew-member’s ID card…? But at 18.30 there was still no sign of the lad – when challenged he gave his position as, “On the bus” – and so, at 18.50, we cast off and went. The tide waits for no man; not even for a fisherman. “You’ll have to join us at the rivermouth,” Yona was told. 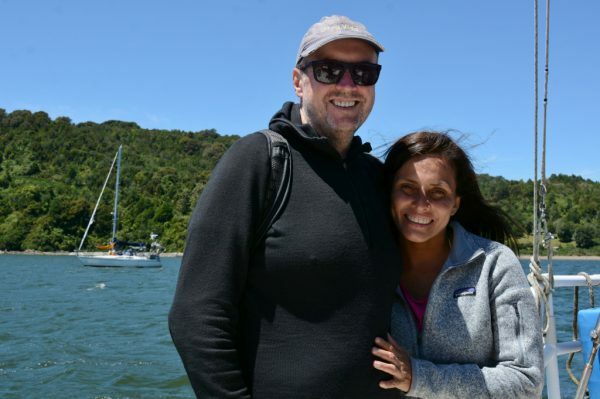 With us aboard the yacht were two of the Valdivia gang (all of whom should have been taken for frequent outings on the river – if only Mollymawk‘s engine had been working much sooner and the new engine controls fitted). Emma and Felipe planned to hop off when and wherever Yona hopped on. 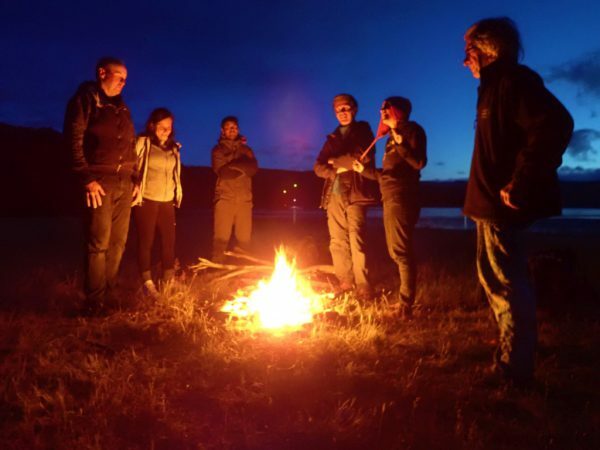 Meanwhile, on the way downstream we must put our noses into Estancilla, which is the other half of the Valdivia Club de Yates, for here dwelled several of the cruising clan, including Beate and Daniel, and that famous stuntman and his swami, and the single-handers. By the time we reached the rivermouth, and the settlement of Niebla, the sun was setting. There he was, waving to us from a fishing boat. Nick rowed over to fetch him. Felipe and Emma were now well into the spirit of things, and so we took them with us as we slid across to the far side of the rivermouth. Otra Vida was anchored behind Isla Mancera, and so we joined her there. 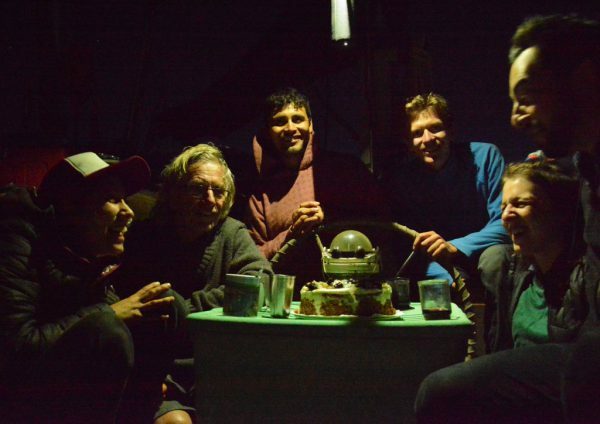 Manu’s birthday was finally celebrated, with cake and songs, by the light of the moon; but the very next morning, the father and mother of our Valdivian family were whisked away aboard another yacht, which just happened to be heading upstream. That just left the cruising clan. That evening we had a little party on the beach with our friends from Otra Vida; and at about midnight, our intrepid friend Nicholas Cobb rocked up in his little home-built boat. 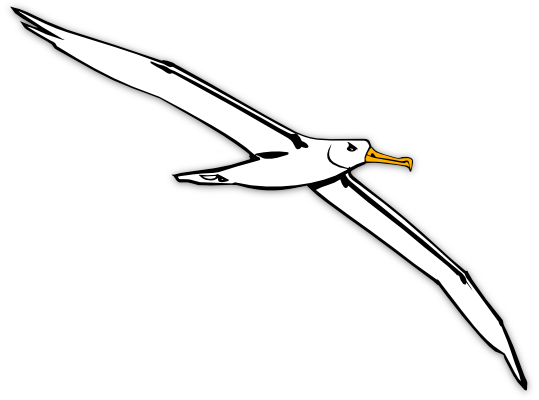 Lacking a dinghy, young Nick pointed Seabird straight at the beach, and when she ran aground, he and his friends simply jumped off and waded ashore. On the morrow, Galadriel arrived from Estancilla, and Daniel rowed his little family across the way to say one more farewell. We first met Daniel and Beate ten years ago in the Canary Islands, and we’ve been running into them ever since – so I can be pretty sure that we’ll run into them again. I certainly hope so, and I hope that we shall have the chance to watch Isabella growing up. In the afternoon we received another visit from young Nicholas Cobb, who brought Seabird alongside Mollymawk. With Nick were his mother and father and sister. Mr and Mrs Cobb are both the offspring of missionaries who came here to exorcise the Roman Catholics – or something of that sort. They’ve been here since they were toddlers, and Nick and his sister were born and brought up in Santiago; but all four of them are completely bilingual and the two youngsters would have trouble persuading an Englishman that they weren’t born on that northern island. 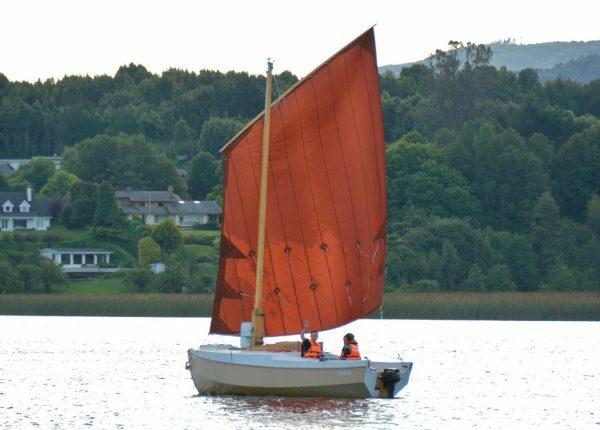 As for Seabird – she is the fifth plywood boat that Nick and his father have built in their garden. They started her when the boy was 14, and when he embarked to study at the university in Valdivia, the boat came with him. Every weekend, and often in the evenings too, Nick can be seen messing about on the river, and there are surely few 19 year olds whose seamanship and self-confidence can match his. Mind you, there a couple of things that I would change about that boat, starting with the dipping lugs’l rig. It certainly doesn’t make for a relaxing afternoon on the river. After Seabird had gone, Yona suddenly announced that, since we hadn’t yet sailed away, he wanted to spend New Year’s Eve with a lady friend. So we rowed him ashore with strict instructions to be back before ten the next day. 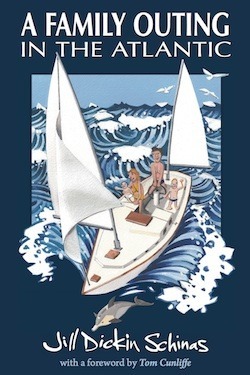 That night, the crew of Mollymawk was invited for supper aboard Otra Vida; and afterwards the two little dinghies were once again propelled towards the beach – two water-beetles scurrying over a dark pond. Like scarabs the crew then scrambled up the hill at the centre of Isla Mancera, for from this vantage one can watch the fireworks on a distant shore welcoming in the new year. An hour later, while the revellers returned home, the pond seemed just as calm as before; but below the surface their now lurked a strong ebb current. The Mollymawks barely made it back to the mothership, and Martin’s little cockleshell was whisked away. Luckily, Caesar’s keen eyes saw them in the darkness. Our hero hopped back into the dinghy, taking with him one end of a shoreline, and the line paid out as he hurried to the rescue. After that, it was a simple matter to pull both dinghies home again – but it’s worth noting that this 100m rope would not have been sitting there, ready to go, had we not recently been travelling in the Channels and using it on a daily basis. Caesar needed all but the last three feet, and had the line been shorter, Martin and Patti would have been spending the night on a dark, cold shore, some two miles downstream from the boats. Did Yona make it back, the next morning? The crew are all aboard. The anchor is away. By the time you read this, Mollymawk will be dancing over the sea.